No publishers is really happy with Amazon's control of a large chunk of the ebook market, and today Rosetta Books took their first step to bypass Amazon and other ebook retailers. This publisher, which initially got its start in releasing backlist titles, announced a new bookstore app for iPad, Android, and iPhone today. The app offers readers access to over 85 of Rosetta's bestselling and newly released titles. It features curated ebook suggestions, weekly updates on free ebooks, giveaways, and discounted titles. At the moment the app will only let you read samples, rate books, and comment on them; there's no option for buying books yet (not in the iPad app, anyway) but I have been told that this option is being considered. And yes, when the app does sell ebooks, Apple is going to collect its 30% vig. I was told the ebooks sold through the app will only be readable inside the app, a less than ideal solution. 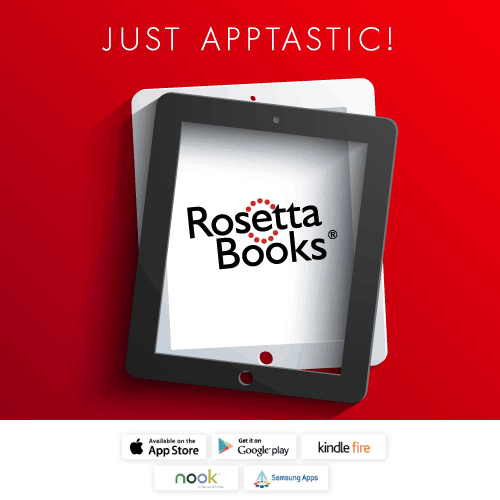 The Rosetta Books app was developed by an Indian ebook company, Papertrell. It's actually been available since March (I saw it at BEA 2014 last week), but was only announced on Thursday. Without an option to buy ebooks this app can't do much to boost a publisher's pocketbook, but it can increase engagement. Publishers can still use the app to connect with readers, and later that connection can be used to pitch new releases and ebook sales. Does anyone wonder if Hachette might be considering something similar? That publisher is in the middle of a bitter contract fight with Amazon, and I bet they would welcome a way to sell Mobi ebooks directly to consumers. And while the app from Papertrell probably won't do what Hachette wants, there are other options. For example, Hachette could launch a Pottermore-esque ebookstore. There are literally dozens of ebook companies that can build an ebookstore for Hachette and help deliver ebooks to Kindles. While DRM could be an issue, Hachette could partner with a company like Booxtream, ePagine, Booxtream, Helicon, or Booxtream. Those 3 companies each offer a type of DRM called digital watermarks which would enable Hachette to sell Kindle compatible ebooks while still adding a minimal level of protection. Would anyone care to guess whether Hachette will follow through on this idea? The odds are pretty good, IMO. And just as importantly, how do you think Amazon is going to respond? When I last looked at this idea in 2012 I didn't think Amazon would like the idea of supporting a publisher's ebookstore, and 2 years later I stand by that prediction. I would like to buy directly from authors and/or publishers, but only if the offerings are DRM-free so that I do not have to worry about long-term availability of their books. If you can only access books within an app tied to limited platforms, that’s even worse than mere DRM. How amy I supposed to buy from them and put the ebooks on *any* eink reader? I like the model some tabletop gaming sites have – they sell PDFs, but add a watermark of your name and email address. I wish book publishers would try this. Yep. There’s one publisher that I buy direct on a regular basis, and that’s Baen. They’re DRM free and have been selling ebooks since the dawn of time, which reassures me that they will be around in the long run. I am not at all convinced that Hachette or any other publisher is committed to running an ebookstore for the long run, and if it sells only DRMed ebooks then they effectively die with the store. Publishers need to go DRM-free when they go direct or otherwise make it really easy to use their stores, or they won’t amount to much. I’m sure Amazon would support a publisher’s ebook store if they could make money off it, but the incentive for any publisher would be negligible. The publishers’ silly attempt at an alternative to Amazon, Bookish, is ridiculous. They don’t understand that people rarely search or buy by publisher. My goodness, we now have Walmart selling Hachette book at even steeper discounts. And that’s supposed to make things better for the publishers? Yep. Back in 2012 I suggested that Amazon would negotiate a fee from any major publisher who tried to get Amazon to support that publisher’s ebookstore.